MERE PLAYERS - Now Available Online! 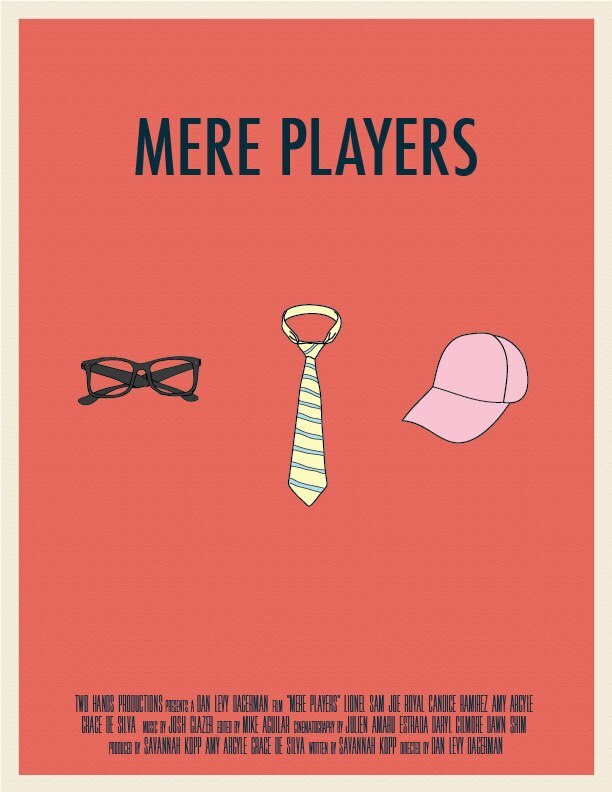 MERE PLAYERS tells the story of an actor who prepares for his roles, one date at a time. Coming off a successful crowdfunding campaign on IndieGoGo, Dan Levy Dagerman was hired to direct the short film. Together with Savannah Kopp and the producer team, we managed to stretch its modest budget to the limit utilizing the Two Hands GH4 package and a small G&E package that was generously donated. The film went on to screen at the 2017 Hollywood Comedy Shorts Film Festival, 2017 California Women's Film Festival, 2017 Sacramento International Film Festival, 2017 DRAFT Film Festival, 2016 Somewhat North of Boston (SNOB) Film Festival, 2016 International Family Film Festival. Below hear from Savannah Kopp (Writer/Producer) and Dan Levy Dagerman (Director) on their experience making the film. One of the most interesting challenges as a director on MERE PLAYERS was to figure out how to use the camera and locations to create different looks for each of the dates that take place in the film that would help augment the story. We shot all of the dates in the same tiny restaurant and wanted them to look different in a way that corresponded with the types of characters Jerome was using the dates to prepare for. For the homeless character we thought it would be interesting to experience the date gone wrong from the POV of Maya (actress, Candice Ramirez), for the high flying business man we chose a more neutral POV to observe Jerome (actor, Lionel Sam) taking on a completely different character for the first time, and lastly for the obsessive compulsive character we thought it would be interesting to play with symmetry. It was certainly a challenge but turned out to be a quite effective style that informed how we shot the final party scene as well. Shot over two weekends, MERE PLAYERS was a joy to work on and I had such a great time working with the entire team! A few years ago, after a lackluster interview for an internship, I thought about how much more interesting it would have been if I’d interviewed not as the most professional, charming version of myself, but as a wholly different character. For an actor preparing for an audition or a performance, an interview could be a creative endeavor, a test of one’s acting skills and mastery of a role, with personal stakes outside of being hired or not. There is a performative nature to life, in that we present ourselves differently, whether consciously or not, depending on our environment. Interviews and first dates are interactions when this self-presentation is especially purposeful: I am the job candidate of your dreams, the person you want to date, the coolest kid in L.A. The idea of an actor taking advantage of first impressions to master his characters took hold in my mind, and it became a way to give people the benefit of the doubt. I’d meet someone, get a strange first impression, and tell myself: the most logical explanation is that this weirdo is just engaged in an acting exercise for the role of “weirdo.” This idea eventually found its comedic outlet when I wrote MERE PLAYERS. The short film follows Jerome, an actor who prepares for auditions by practicing his characters on blind dates. Following their festival runs Two Hands is making their short films available for the first time online. Join us every Monday for the next month for the release of a new short! Bright Ideas, is a proof of concept webseries and TV/Digital series in development that is based on characters created by Carli Olsen and Darcelle Ross. The characters Kelly and Simone are social media obsessed millennial incarnations of Cher and Deon from Clueless. SOLILOQUY: Wins Best Short Film at the Nice International Filmmaker Festival 2016! At its international premiere, Soliloquy wins Best Short Film at the Nice International Filmmaker Festival 2016. Directed by Dan Levy Dagerman, written and produced by Selina Ringel and Ivana De Maria, SOLILOQUY, starring Ivana De Maria and featuring a voice-over by Joan Roberts, tells the story of an actress who reflects on the sacrifices she made for a life in the spotlight. KNOCKERBALL: Spot nears 1M views on Facebook! TWO HANDS PRODUCTIONS teamed up with collaborators Johnny Cannizarro (actor - Mere Players, Jersey Boys) and Art Napiontek (actor - Switch Hitter, Pineapple Express) of KNOCKERBALL HOLLYWOOD to produce the commercial for ZOOM TV PRODUCTS latest product KNOCKERBALL. REAL LOVE is a feature film in development by Two Hands Productions and a proof of concept short film produced as Producer Selina Ringel and Director Dan Levy Dagerman's Thesis Film at the American Film Institute. THE MANNY is a TV Pilot Presentation created by Monty Franklin & Simon Bell, produced by Selina Ringel directed by Tim Bathurst, about a laissez faire Aussie surfer finds himself answering to Malibu's most desperate housewife after marrying her for a green card during a drunken night out. Starring Anna Lieberman, Charley Rossman and Marque Richardson TOO LEGIT is set in the mid 90s tells the story of a police officer who is determined to arrest her estranged hitman father. When her dad hijacks her cop car and forces her to take him to his next hit he tries to rekindle their relationship.